Distributed Stream Processing (DSP) systems have recently attracted much attention because of their ability to process huge volumes of real-time stream data with very low latency on clusters of commodity hardware. Existing workload grouping strategies in a DSP system can be classified into four categories (i.e. raw and blind, data skewness, cluster heterogeneity, and dynamic load-aware). However, these traditional stream grouping strategies do not consider network distance between two communicating operators. In fact, the traffic from different network channels makes a significant impact on performance. How to grouping tuples according to network distances to improve performance has been a critical problem. In this paper, we propose a network-aware grouping framework called Squirrel to improve the performance under different network distances. Identifying the network location of two communicating operators, Squirrel sets a weight and priority for each network channel. It introduces Weight Grouping to assign different numbers of tuples to each network channel according to channel’s weight and priority. In order to adapt to changes in network conditions, input load, resources and other factors, Squirrel uses Dynamic Weight Control to adjust network channel’s weight and priority online by analyzing runtime information. 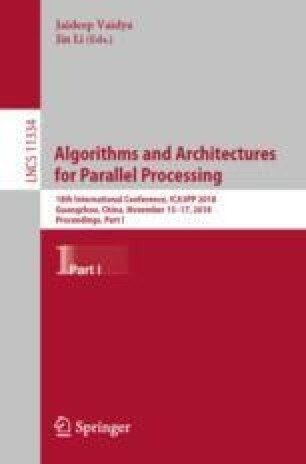 Experimental results prove Squirrel’s effectiveness and show that Squirrel can achieve 1.67x improvement in terms of throughput and reduce the latency by 47%. This work was supported by National Key Research and Development Program under grant 2018YFB1003600 and Pre-research Project of Beifang under grant FFZ-1601.